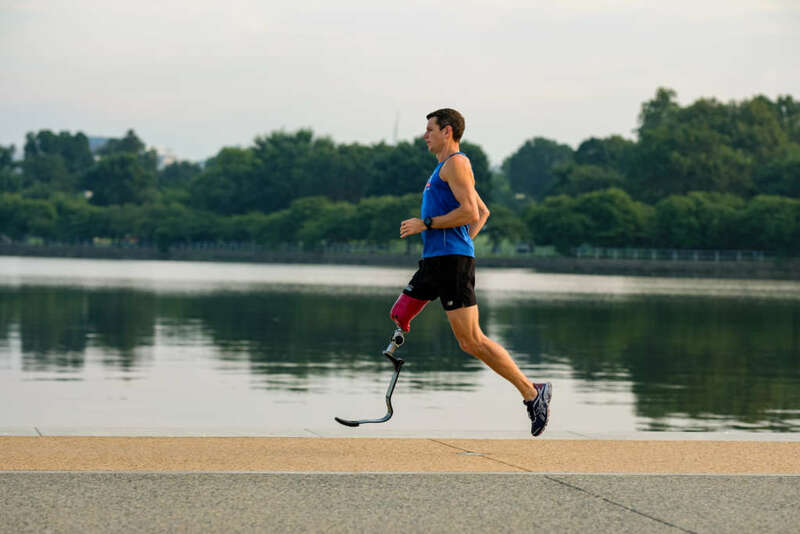 When Adam Popp heads to the start line at the Navy Air Force Half Marathon on Sunday, the pain of the marathon he ran just days before will be fresh. But the Air Force veteran who lost his right leg above the knee after an explosion in Afghanistan in 2007 knew he had to make room in his schedule for the half marathon that holds special meaning to him. 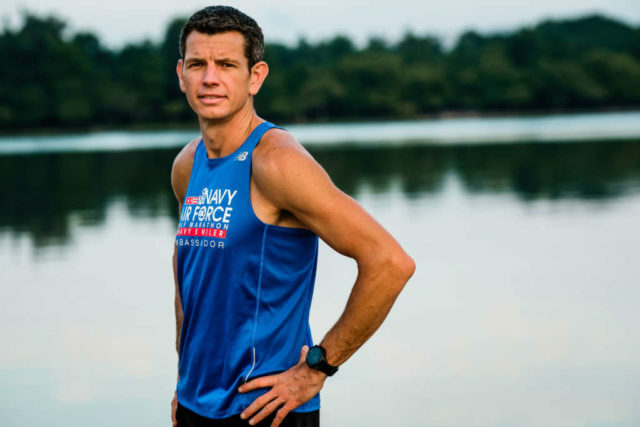 In 2015, only four months after he took up running seriously, Popp finished the Navy Air Force Half in 1:44:29 — much faster than his first try at the distance eight years earlier. “Long story short, I ran that half marathon faster than I had when I had two legs,” Popp said. Since that race three years ago, Popp has become a full-fledged distance runner and pushed himself to the top of one challenge after another: a Boston Marathon finish, the first amputee to finish the Stone Mill 50 Mile and the first above-the-knee amputee to complete the JFK 50 Mile, and two sub-29 hour 100-mile finishes. And he’s just getting started. Growing up, Popp wasn’t a runner. During high school, he played soccer and competed in long jump — picking the event because he wouldn’t have to run very much. After graduating from high school, Popp enlisted in the Air Force in 1997 and became an explosive ordnance disposal specialist — in effect, a member of the Air Force’s bomb squad. While in the military, Popp had to run to maintain fitness, and he realized he was fast, but he still didn’t find much joy in it. Before he deployed to Afghanistan in 2007, Popp recalled running one distance road race, the Little Rock Half Marathon, after being prodded by a friend who wanted to do the race. He didn’t take the training seriously and finished in 1:44:50. He still didn’t consider himself a runner at that time. Popp soon deployed to Afghanistan and was in the country for about four months before his team was called Dec. 7 to disable an IED that had been identified underneath a road. They removed as much of the device as they could using a robot, but Popp had to put on a bomb suit and remove the rest of it by hand. He did that and was making a final sweep of the area when a second device exploded. Popp suffered numerous injuries and doctors ultimately amputated his right leg above the knee several days later. He spent a little more than a year undergoing rehabilitation at Walter Reed Army Medical Center and was fitted with a prosthetic leg. He tried to run a little bit during that rehabilitation stint but had to stop when he had complications in his hip (which had been fractured in the explosion) and the doctors told him to stay away from high-impact activity. Running didn’t crop back up in Popp’s life for several years. In 2015, he was putting together a team of wounded veterans for the EOD Warrior Foundation’s team entry to “Ski to Sea,” a Washington State relay race involving skiing, road running, biking, canoeing, and kayaking portions. Popp had organized a team for several years prior but always begged off of doing the cross-country skiing or running legs. But in 2015, there wasn’t enough snow to hold the ski portions of the race, and the race replaced one of those legs with a trail run. “I always had a hard enough time finding runners anyway, and now I had to find two, so that was a catalyst, for OK, I’m going to try this out now,” he said. But it was even more difficult to get his cardiovascular fitness back, Popp said, because he hadn’t been that active since the accident. Still, over the next several weeks, he worked his way up to running two to three continuous miles in the parking lot. Popp decided to enter a local race, the Capitol Hill Classic 10K, the week before Ski to Sea to test his fitness. “That was a breakthrough,” he said. Popp ran 55:17 (a little over 8:50 minutes per mile) at the Capitol Hill Classic and said that race “hooked” him on running. He completed the Ski to Sea trail running portion and came back to D.C. to start looking at what races might be next. He decided to nearly double his distance and signed up for the 2015 Navy Air Force Half Marathon, finishing 20 seconds faster than his time at the Little Rock Half Marathon eight years before. Along the way, Popp found others, in the D.C. area and at races, who helped push him to his limits, and who became friends in the process. He shares a particularly special bond with Andre Barbieri, a paratriathlete who competes for Brazil. Barbieri lost his left leg above the knee in a 2011 snowboarding accident, while Popp is missing his right leg. Between the two of them, they have lots of running shoes — one half of every pair — that don’t get any use. So Popp decided this summer to ship his extra right-side shoes to Barbieri in California — in effect, making the two athletes “sole mates,” as Barbieri calls them. Although Barbieri had just gotten rid of most of his “leftovers” when he received Popp’s gift, he said he recently sent Popp a few left-side shoes in return. But Popp, with his mileage and ultra races, will wear those out quickly, Barbieri predicts. Other athletes have bonded with Popp in more conventional ways. Jason Tomasetti, of Arlington, is one of Popp’s local training partners. They met at a local practice for Team Z (a triathlon training club) in 2015 and bonded over being in the military (Tomasetti is in the Army) and soon ran the Army 10 Miler together. They now train together nearly every week. “He has a diesel engine that just keeps going,” Tomasetti said of Popp. Popp chose Tomasetti to be one of his pacers at the Blistering Barnacle 100 Miler in Missouri on the weekend of December 9, 2017. While the distance wasn’t insurmountable (Popp had already completed one 100 miler the year before and ran the Stone Mill and JFK 50-milers leading up to the Missouri ultra), it was important to Popp to have his close friends and family at the race, since it took place almost 10 years to the day after the explosion. Tomasetti, Popp’s two brothers, and a member of his Air Force team who was present at the explosion all paced Popp at different points during the race, and Popp’s parents were part of his crew that weekend. Popp experienced some tendonitis and finished the race in 28-and-a-half hours. But this race was more about the experience than the time, he said. And while he has accomplished a lot in the three years since he started running, Popp has no plans to stop any time soon. For now, he will try to set PRs in the marathon, the 50K, and the 50-mile distances. After that, it’s anyone’s guess, but Tomasetti predicts Popp will keep pushing himself to the bounds of what many think is possible.